MultiObfuscator a convenient tool for strong data encryption. It offers a range of possibilities of securing files. 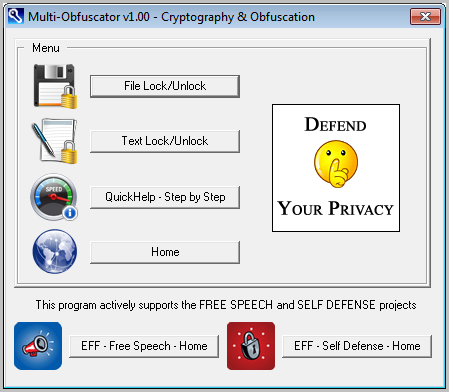 MultiObfuscator is free application used to encrypt the data . Files can be encrypted using a 256-bit, and using up to four layers of encryption - each may have their separate password. You can use the password generator, and select one of the sixteen encryption algorithms. MultiObfuscator does not require installation on your operating system . We recommend to anyone who wants to increase the level of privacy of their data.